In the wake of the recent gutting of the Voting Rights Act, partisans were quick to jump on the opportunity to restrict unfavorable voters. Across the country, conservatives in particular have debated fiercely whether to pursue voter suppression to remain competitive in an increasingly diverse electorate. There was, however, another way out, as I've argued before: Socially and economically conservative values are not unpopular, and if conservatives were to cease supporting people who made speeches at KKK rallies, they could garner enough votes to remain competitive. I worried, though, that the temptation of voter suppression would be too great. 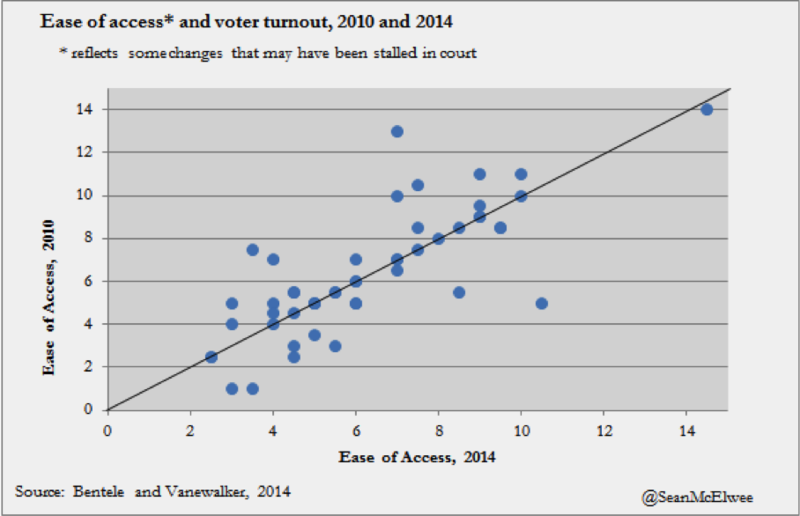 And, indeed, a new paper by Ian Vandewalker and Keith Bentele indicates that partisans have chosen the path of voter suppression to an even greater extent than previous thought. The study finds that between 2006 and 2012, the most influential factor in determining whether a law would be passed was Republican control of government. It also finds that the level of anti-black stereotyping in a state (a measure based on survey respondents' beliefs about work ethic and intelligence) strongly correlates with the proposal (though not the passage) of voting restrictions. 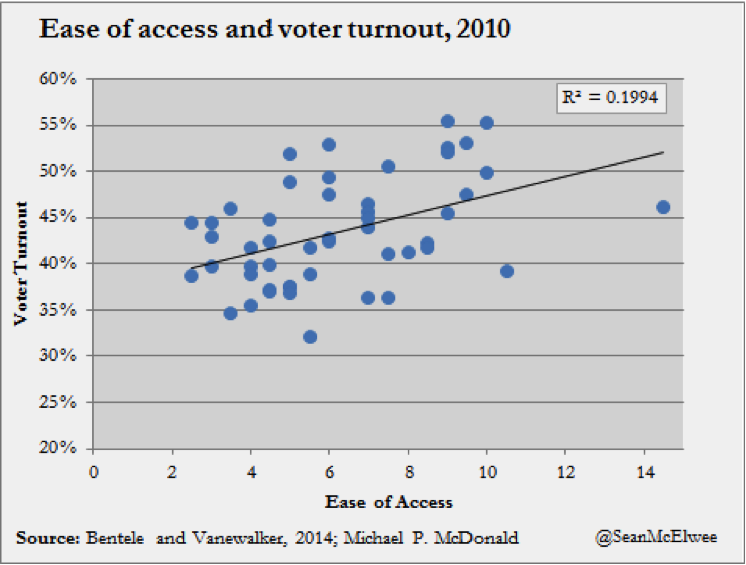 Vandewalker and Bentele find that states with a recent increase in Democratic turnout were more likely to pass a restriction indicating “the passage of voter restrictions as a partisan response by Republicans to recent Democratic electoral gains.” States with large black populations were significantly more likely to pass restrictive laws. Finally, they note that what little voter fraud exists does not correlate at all with voter restrictions. The GOP has dramatically expanded its control of state legislatures in recent years. Before the 2014 election, Republicans controlled 59 of the 98 state legislative chambers; they now control 67. MSNBC recently reported that Republicans are already working to pass voter ID laws in five major states. 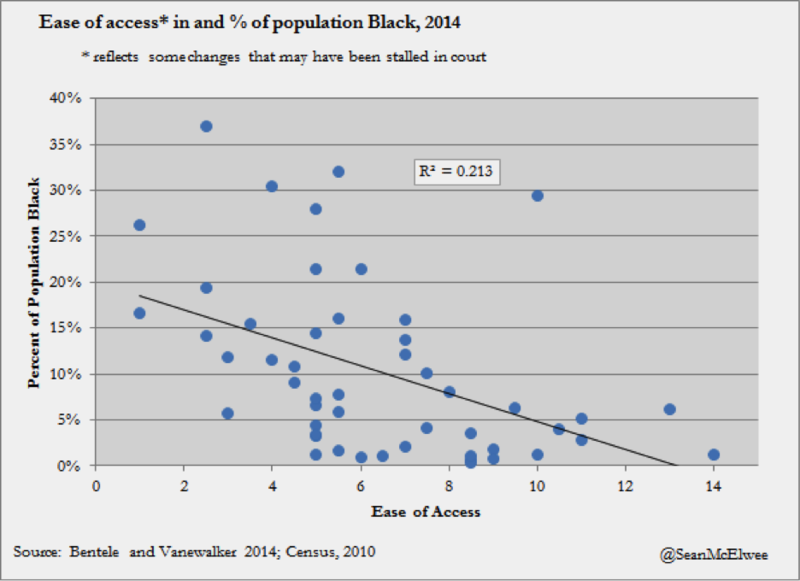 Bentele and Vandewalker’s analysis indicates that “restrictive voting laws are often discriminatory responses to minority voting strength.” They find that the correlation between anti-black attitudes in the state and a restrictive voting system increased between 2010 and 2013. Conservatives have moved beyond just pushing for voter ID and have also worked to curb early voting and other important methods to increase access.